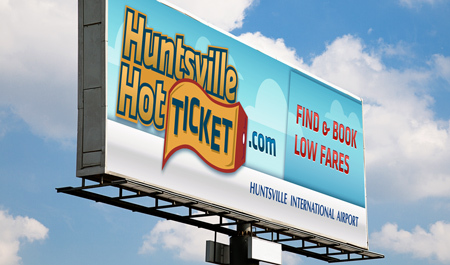 In 2005, McComm Group partnered with long-time client Huntsville International Airport (HSV) to develop an e-mail marketing program that would inform the flying public in the market about low fares from Huntsville with an ultimate goal of increasing passenger traffic from Huntsville. 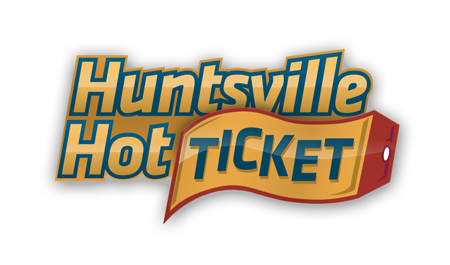 First, we developed the Huntsville Hot Ticket (HHT) name and logo. In our strategy sessions, we determined that for this service to create a loyal following, it needed to be fun (travel is fun!) and to have a recognizable, personal spokesman. 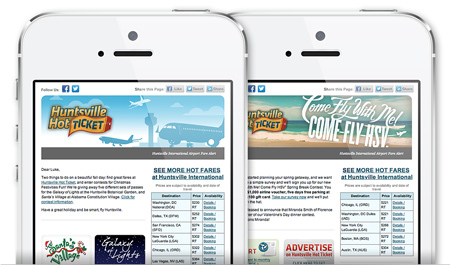 Previously, we used an unnamed dachshund – live and animated versions – in successful campaigns touting low fares from HSV. For Huntsville Hot Ticket, we built upon this idea by naming the dog Trusty and incorporating him into the emails, web site, and marketing efforts. A costumed Trusty even made appearances at local events and always drew a crowd. In 2012, Trusty decided he had fetched enough fares to exciting destinations for others and he deserved a long vacation of his own. The McComm Group bid him bon voyage and took over the twice-a-month emails and redesigned web site graphics. To keep our 30,000+ strong, loyal membership informed and connected, the HHT program sends low-fare alerts and opportunities to win great prizes. We encourage travelers to share their stories and still get a post card from Trusty every once in a while.